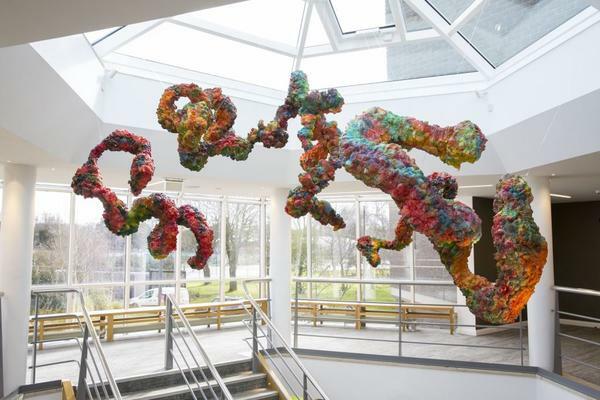 Over the Easter break, current MFA student Lester Korzilius installed a sculpture at Chichester Festival Theatre, which will remain on public view until 30th December 2018. Ascension is positioned high up in the atrium of the Minerva Theatre, with the stairway and balconies of the theatre offering multiple perspectives on a complex series of forms. Ascension explores the phenomenological aspects of movement and the viewer's place in the context of a series of cascading spirals, taking cues from the Vatican Museum and the Guggenheim in New York. 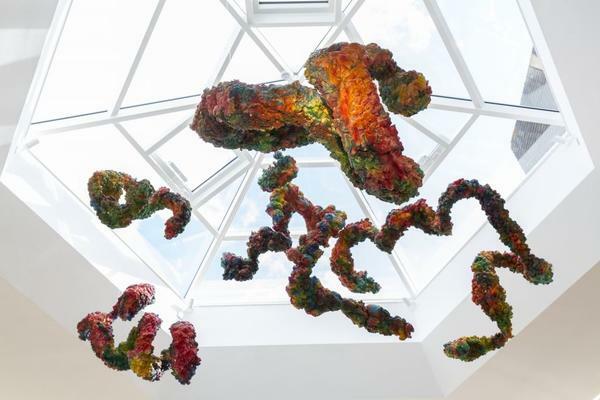 The work also investigates the concept of sculpture as an armature for colour. Seen from various distances, the intricate complexities of the textured surfaces suggest shifting colour fields, in which the status of colour values is inextricably connected with (and made complex by) other factors, including surface area, compositional form, saturation and perspective. Lester Korzilius is an artist and architect practicing in London and the south coast. He is currently pursuing an MFA at West Dean College in West Sussex. All photographs by Michael Austen. Lester Korzilius - Ascension [installation view] (2018) Acrylic paint, polyurethane, wire mesh, steel, monofilament line. Dimensions vary.